Sad to belatedly discover that Singuhr, the venerable sound art gallery sited in an underground former reservoir in Prenzlauer Berg, has wound up its operations due to a shortage of funding. The internal architecture of the Wasserturm -- a network of concrete alcoves, with a large circular tunnel around the perimeter -- made for a unique and powerful acoustic environment, exploited by many of the artists who exhibited there. Hearing Gordon Monahan's Resonant Platinum Records there was one of the most singular listening experiences I can remember, lightly resonating through the vaults. Its quietness in the cavernous space gave a unique and unexpected kind of intimacy. It sounds like Singuhr intend to continue programming events elsewhere on a project-by-project basis. Let's hope that upping sticks will give rise to new locations and new sonic possibilities. This is where I'd like to spend my next holiday: a tropical island-world enclosed within an ex-blimp-hangar south of Berlin. Photographed by Christopher Morlinghaus, whose staggering architectural photography flips between the geometrically pure and viscerally complex. Going through old material to publish online, I happened upon the piece that I wrote to accompany Julia's article for They Did magazine. 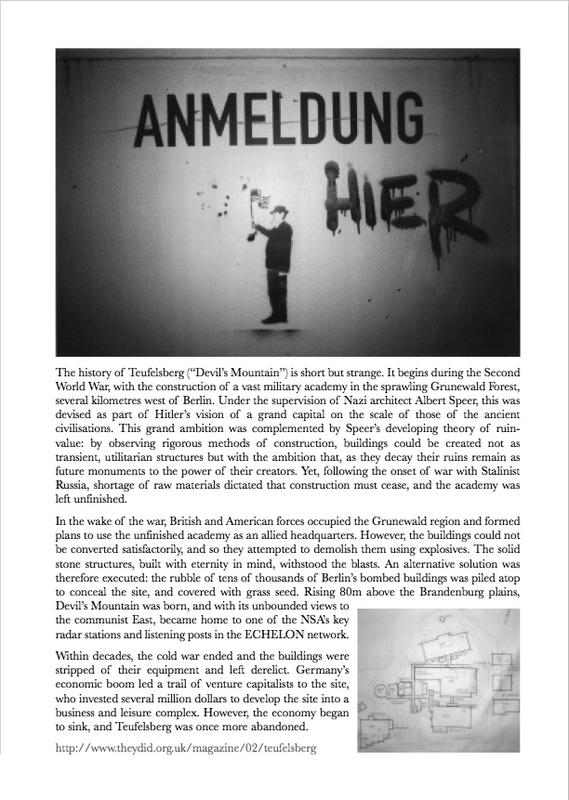 It describes the history of Teufelsberg ("Devil's Mountain"), a man-made mountain west of Berlin that later became a key NSA radar station in the cold war. Unearthing this piece reminded me of the addendum that I've intended to write since the end of last year. In November, the David Lynch "Invincible Germany" story spread wildly around the web, implicating him alongside a Transcedental Meditation guru whose rhetoric rung a little too close to that of National Socialism. There's even the obligatory YouTube video of the lecture, and a later response from Lynch himself. However, what really captured my attention was the fact that Lynch has purchased Teufelsberg as the site for a future cathedral to Transcendental Meditation - an "invincible university" atop Devil's Mountain, and the latest in a series of its radical reinventions. As Time observe, Lynchian indeed.